대방광원각수다라료의경은 줄여서 ‘원각경’이라고 부르기도 하며, 우리나라 승려들의 교과과목으로 채택되어 불교 수행의 길잡이 구실을 하는 경전이다. 우리나라에서는 고려의 지눌이 깊이 신봉하여 ‘요의경’이라고 한 뒤 크게 유행하였다. 상지금니대방광원각수다라료의경(橡紙金泥大方廣圓覺修多羅了義經)은 갈색 종이에 금색 글씨로 불경을 정성스럽게 옮겨 쓰고, 불경의 내용을 요약하여 묘사한 변상도(變相圖)를 그려 화려하고 장엄하게 꾸민 것이다. 병풍처럼 펼쳐서 볼 수 있는 형태로 되어있는데, 권 상·하를 합쳐 한 권의 책으로 엮었으며, 접었을 때의 크기는 세로 26.5㎝, 가로 11.5㎝이다. 간행기록을 보면 고려 공민왕 6년(1357)에 최적과 김청 등이 계항(戒桁)의 명복을 빌기 위해 펴낸 것이다. 책 앞부분에는 신장상과 변상도가 금색으로 그려졌고, 본문에는 지공 스님의 무생계법문(無生戒法文)과 혜능(慧能)의 법보단경(法寶壇經)이 실려 있다. 글씨를 쓴 사람을 알 수 없으며 전체적인 솜씨가 떨어지지만, 고려시대 불경의 격식을 갖추고 있는 중요한 자료로 여겨진다. The Mahavaipulya purnabudha Sutra, which is also called the Complete Enlightenment Sutra, may be viewed as a sort of “course” on ascetic practices intended for Buddhist monks in Korea. 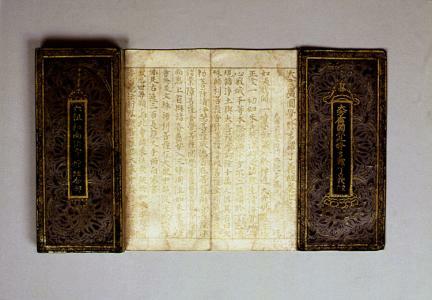 It was made widely known by Monk Jinul of the Goryeo Dynasty, who closely adhered to the principles of this sutra and called it the Youigyeong Sutra. 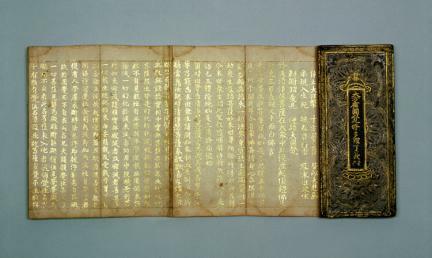 The sutra is written in gold on brown paper and decorated with Byeonsangdo, an illustration that briefly describes the contents of the sutra. 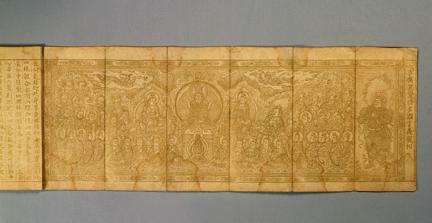 Measuring 26.5 cm in length and 11.5 cm in width, this is a collapsible sutra, akin to a folding screen. This transcription consists of the first and second volumes bound into one book. 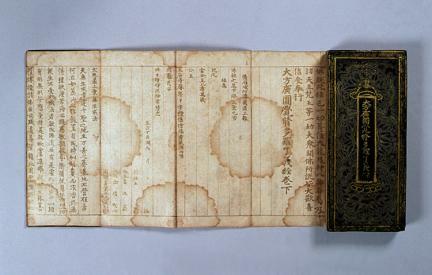 According to the publication record, this transcription was made by Choe Jeok and Kim Cheong in 1357 (the 6th year of the reign of King Gongmin of the Goryeo Dynasty) in order to pray for the bliss of Gye Hang. The front page conains pictures of a guardian deity and Byeonsangdo, and the text includes scriptures written by two monks named Jigong and Hyeneung. Even though the writer of this transcription is unknown and the workmanship is not of particularly high quality, it is regarded as an important material that reveals the formality of sutras of the Goryeo Period.